ARES is a proven, fibreglass construction traditional design with raised salon and walk-in engine room. 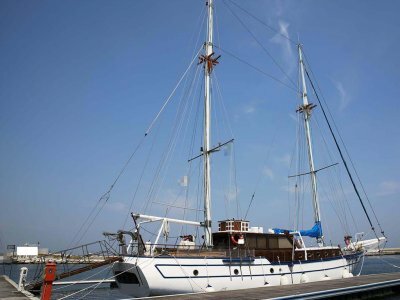 She features spacious, practical accommodations and can be handled by a small crew. Additionally, she has twin engines, Stoway rig, two helm stations, two cockpits, and two draft options (courtesy of the centerboard) which provides great flexibility for maximum cruising pleasure. The recent extensive refit went well beyond paint and varnish. Systems, hoses, teak decks removed and glassed, countertops, re-chrome, window frames, engines serviced and generators rebuilt. In addition there are new Raymarine electronics (2014-2016). Hauled and bottom painted (March 2016). 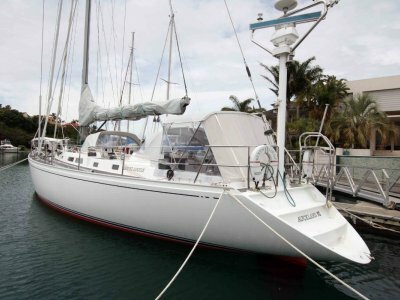 Fully updated and maintained by a meticulous owner, she is ready in every way for extended cruising adventures. Accommodations are provided for six owner/guests in three aft cabins. Two guest staterooms feature twin berths with a bureau between and ample hanging locker/drawer storage. Each includes an ensuite bathroom with stall shower, vanity and electric head. The port head also serves as the day head, with access from the central passageway. The full-width master stateroom is all the way aft, with a queen berth to starboard and to port is a three-quarter berth and settee. There is a desk and good storage throughout with drawers, shelves and hanging lockers. Aft is the master bathroom with a large shower and sink to port and another sink and electric head to starboard. The passageway between provides access to the aft cockpit and the cockpit hatch providing ventilation. This include an additional two cabins for three people. The port crew cabin has a double lower berth and single upper berth. The starboard cabin features a large single berth. Aft of the crew cabins is the galley with crew dinette with seating for four. The washer/dryer is to starboard, across from the crew head. From the forepeak aft is a sail locker/utility room. Aft of the 'crew' quarters is the raised salon, with six large windows providing an abundance of light and visibility. Two windows, port and starboard, are opening, providing excellent ventilation. An L-shaped settee is to port. The large varnished hi-lo table can seat eight for dining, or, when lowered, serves as a cocktail table. Drawer storage has been redesigned and reconfigured for custom china and cutlery. The entertainment center is aft to port (see Audio/Visual). A lounge area is starboard with settee, full wet bar with sink, refrigerator, custom glass and bottle storage. Next aft to starboard is the navigation station. Aft and down four steps from the saloon are the owner and guest staterooms and the entrance to the engine room. There is teak and holly flooring throughout, joinery work is teak, wallcoverings are neutral colors with teak trim and headliner is Ultrasuede. There are two cockpits on deck; a center steering cockpit with centerline helm aft and a second protected helm which is forward to port and an aft owner's cockpit with access from the master stateroom. The center steering cockpit is large and comfortable; accessed from deck both port and starboard. The canvas dodger and bimini provide protection for the entire area. To starboard is a refrigerator/freezer for drinks; to port is the protected helm. The large centerline drop-leaf table can seat up to eight for dining. Settees port and starboard in this cockpit have been widened for more comfortable seating and also to accommodate outdoor sleeping. The second steering wheel is aft of the table, allowing the helmsman contact with guests. Private owner's cockpit - The private owner's cockpit is recessed into the aft deck, with settees port and starboard and a filler to convert to a double bed for sunbathing or outdoor resting. The vessel is cutter rigged, with Hood hydraulic furling: in mast on the main, and roller furling on the head sail. Rod rigging and the hydraulic backstay are by Navtec, and most deck gear is by Harken. 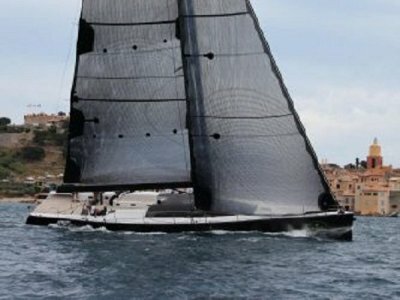 In 2009 the mast, boom, spreaders, and spinnaker pole underwent a complete refit. The entire rig was painted with Awlgrip "Fleet White", all electrical wiring was replaced along with the two aluminum conduits being re-fastened to th mast. The sheaves were turned on a lathe and then hardcoat anodized. The stainless chafe plates on the entrance and exit slots in the mast were replaced. The seven light fixtures were installed new. All of the -48 and -60 Navtec Nitronic 50-rod rigging was replaced including new 150 K-150 mast tangs. The bronze bottle screws in the turnbuckles were replaced. All of the running rigging was replaced. The 20- Navtec Nitronic 50 rod in the main sail furling foil was replaced. New doublers in the base of the mast were installed. A new lightening rod was installed. Bronze lightening grounding plates were installed 12" below the waterline midships. Spreader lights illuminate both deck and rig. 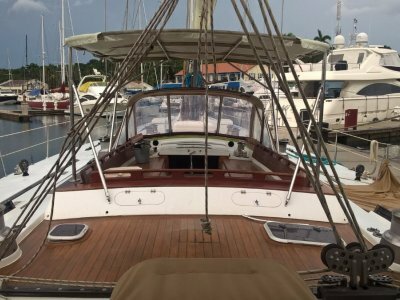 All deck hardware including pulpits, stanchions, chocks, Dorade guards, cleats, tracks, bimini and dodger frames were replaced and upgraded to 316 stainless. In 1996 & 2013, the vessel underwent an epoxy coating on the bottom to prevent blisters. The deck is fiberglass with a Balsa and marine ply core and is finished in moondust Awlgrip (2016). The solid glass rub rail is integrally molded. The main centerboard is fiberglass with a bronze shoe. Trimming centerboard aft is solid bronze. Fuel injection pumps were rebuilt, new water pumps installed, and injectors were rebuilt. The main propulsion shafts (six sections) were removed and straightened and new split babbit journal bearings installed; new cutlass bearings were installed in the stern tubes and struts.